Figura 1.13, “GFS e GNBD com Armazenamento Conectado Diretamente” shows how Linux client applications can take advantage of an existing Ethernet topology to gain shared access to all block storage devices. Client data files and file systems can be shared with GFS on each client. 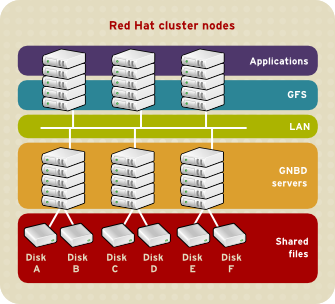 Application failover can be fully automated with Red Hat Cluster Suite.